Electric Based Systems, Pitless Design, Economical and Elegant. 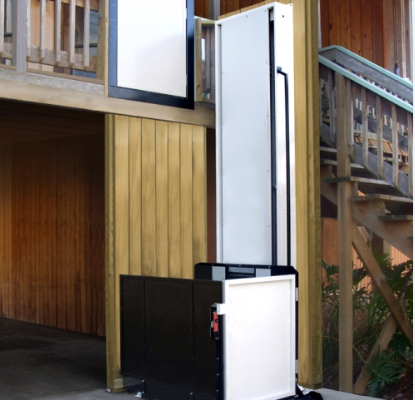 This lift falls under the code (CSA B355-15) lifts for persons with physical disabilities, but has the look and feel of a full elevator. Devin Oliver, Family 1st Medical’s Elevator and Lift Co-ordinator is from the Annapolis Valley but has been living in the town of Antigonish for more than 16 years, originally moving there to work as a paramedic. On the job, he ended up meeting his wife and Family 1st RRT Dawn and the two eventually settled down together. Devin and Dawn have two active boys and enjoy rural Nova Scotia living. Devin has a love for the outdoors and enjoys hunting, fishing and also being a minor hockey coach.